Nikita is 3 years old and is currently available for rehoming. Please come in and ask to meet her. 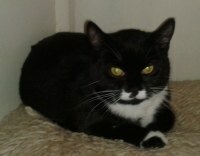 Nikita is a lovely young lady – although a little shy initially she does look for attention. Are you ready to give her a chance?